The look of cherry blossom, which informs the peak of spring, fluttering down one by one is as beautiful as its bloomed look just like flower rain falling. Feel the memory of walking in the cherry blossoms with your lover in your closest space. 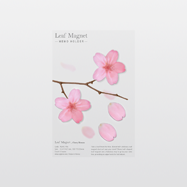 Realistically made cherry blossom-shaped magnet can be used for various places like partition, white board, refrigerator and etc and you can create the feeling of cherry blossom fluttering down with it as interior prop.